The history of contemporary Turkey is that of vengeance. 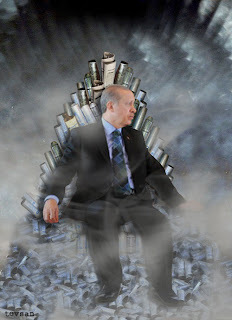 The oppressed and the oppressors take turns sitting on the Iron Throne, and today&apos;s announcements on the Ergenekon Trials, which, in a nutshell, was the conservative right wing&apos;s Monte Cristo moment, resulted in the incarceration of countless military officials and various notable figures. The verdicts are being announced live. There have been many debates over whether Ergenekon or another coup d&apos;etat against AKP should have succeeded. Some of my friends argue that it would have prevented the violence we have endured at Gezi, but then again, my generation is clueless about government oppression, and I am clueless about resistance. Beginning with May&apos;s first Gezi protest in Turkey, we have convinced ourselves that we are experiencing a unique and unacceptable phenomenon. As a result of our self-righteous outrage, though we have been loud and perhaps instrumental, our clout will wither away come summer&apos;s end. I remember one day in June when, running away from the police and the teargas, my best friend and I had found ourselves on an isolated street. He was furious when his father told us to go further away from Taksim, saying, "But I want to be there! I want to build barricades! I want to resist!" My generation has certain notions of justice and honor that Western media franchises spoon-fed to us as children, and they all contain forms of resistance where the act of resisting renders the resistee the good guy and the oppressors evil. This narrative has been quite evident throughout the Gezi protests, including in my own writing. Whether it is true is irrelevant because as a result of this narrative, we have inadvertently emphasized our youth. We think it heroic when we are in fact, dealing with a remarkably humane form of government oppression. Please do not consider for a second that I am refuting my previous arguments against police violence. I am merely drawing attention to the fact that past events of similar nature have been remarkably violent. Plenty of lives would have been spared had the military used plastic bullets and teargas, and if Twitter-driven accountability existed in the 1970s. Now consider the fact that we are the children of men and women who lived through two or three coups d&apos;etat. It is also important to note that when I mentioned these parents, I refer mostly to those who are referred to as white Turks, the Kemalist, middle-to-upper-class urbanites that are largely responsible for most political and financial proceedings in Turkey. In their eyes, although what we did and continue to do is noteworthy, we are merely children, and Gezi pales in comparison to the Twilight Zone experience they lived through, several times. We may have started something, but politics is their province, not ours. Despite being remarkably vocal about our discontent, our votes will not alter the Turkish political landscape, our parents&apos; will. Our parents are set in their ways. They were raised with mostly secular notions of conservative Islam, but they were conservative people nonetheless. The craziest thing they did when they were our age was to have their hair done a-la-Dallas&apos; Pamela Ewing. Tradition and set ways were and are still the norm. There exists a deep chasm between my generation — the Y Generation — and our parents. Unlike the disenfranchised Y-generation, who will not vote for AKP or the breakaway, as-of-yet-unnamed party signaled by the departing of Vice-Prime Minister Bülent Arinç, our parents will likely vote for the new option, opting for a Fethullah-fueled government&apos;s stability (likely to be led by Abdullah Gül, who will be eligible to become party leader once his post as president ends in 2014). The alternative, that my generation will support, is the unknown future that fledgling new parties, independent candidates, a confused MHP and a flailing CHP promise. Coming elections will be eclectic, with votes divided unless a very popular figure emerges from any given party, though most party structures will continue to inspire mistrust if they remain the same. Our parents still have strong opinions about Kurds, Armenians and hijabis. They have fixed ideas for how the economy works and what needs to happen in order for business to thrive. They will never vote for people they do not know, for parties whose members do not include CEOs and shareholders. They have failed to pass on their prejudices. The simplest example I have to offer is that such distinctions do not occur to me when I meet people, and I do not want the person I vote for to have corporations that he or she will consider when voting on bills. The Y generation&apos;s parents follow Kemalist ideals, but for the most part they have not hesitated to do business with AKP or Fethullah followers. It is this tendency to consider business before political values that has allowed AKP to thrive over the past decade. So long as our parents can vote, Turkey will be stuck in the same nepotistic, neo/faux/modern/reformed Islamist political vortex it has been. Gezi might change everything 10 years down the line, but for the immediate future, don&apos;t hold your breath.